A wild police chase straight out of “Grand Theft Auto” ended with the woman’s SUV rolling over three times and ejecting her from the car. Somehow, the 24-year-old South Carolina woman survived. Brittany Jeffords was pulled over by police on July 12 for a traffic violation, but after initially cooperating with police — and allowing a man to step out of the passenger side door — Jeffords sped off, dashcam video provided by the Florence County Sheriff’s Office showed. The chase wound through much of Florence, with Jeffords refusing to pull over. She careened through miles of road — and abandoned lots — for over 15 minutes. At one point Jeffords sped through a trailer park, clipping one trailer and narrowly missing flabbergasted onlookers. “She tore that trailer up right there — the third one. She hit it and knocked steps and all off. She almost hit two little guys standing in the yard,” Jenell Dixon told WPDE. Eventually, after returning to the highway, police performed a pit maneuver, which sent the SUV sideways and rolling over on its roof three times before settling on four wheels on the shoulder of the road. As debris flew from the vehicle during the barrel rolls, Brittany Jeffords was ejected from the vehicle. 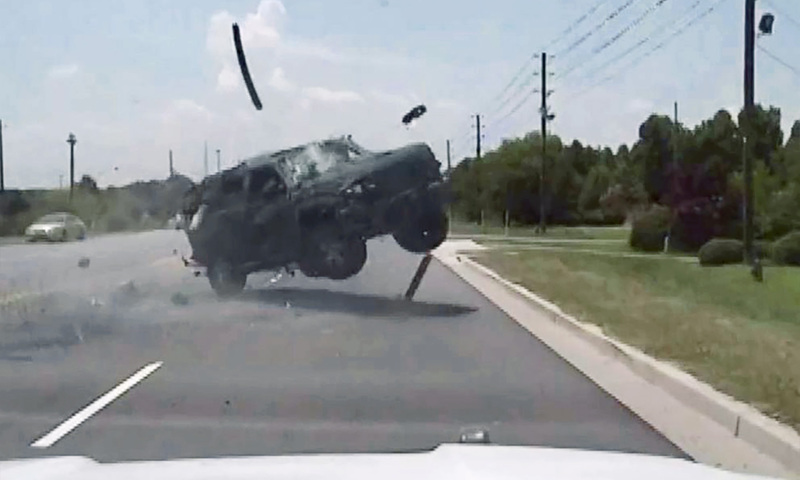 The dashcam video shows Brittany lying in the road, barely moving her feet, as the SUV settled in the grass a dozen feet away — engine still smoking. She was taken to the hospital in serious condition, with non-life-threatening injuries, according to her sister. “I don’t think the cops should have pursued her into the trailer park. Not only down the trailer park road, but through the trailers,” Jamie Jeffords said.